Cammy Bean's Learning Visions: Do Instructional Design Degrees Get "Wasted"? In my recent post Instructional Design - What's in a Name? the usual controversy erupted. 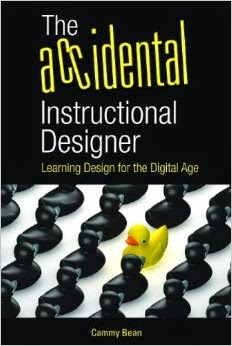 My problem with the industry is that the degree in instructional design is required of management. which is pretty stupid. My (educational) background is in Management of technology (MBA/IT). I've seen jobs that require a MA/MEd/MS in ID even though those individuals in those jobs don't design instruction. They manage people who design instruction, people who manage LMS, and they are the in-between people between upper management + clients, and the people who provide the design and training. You truly don't need an ID education for that. How does this comment compare to your own organization? Is the degreed-ID the department manager and not doing any actual design work? Is that a waste of an ID degree? In Dr. John Curry's recent interview series with practicing instructional designers, he asked Dr. Andrew Teasdale what advice he would give to ID students and what he himself did not learn at school that he could've used. Teasdale is an instructional designer in the corporate market. "What it means to be a consultant." "You need to speak the business language." " You should get an MBA along the way." "You need to know how to work with other groups and meet their needs." Instructional Designers (myself included) often must wear many a hat. For some people, this isn't the right fit. Why has the role of the instructional designer (at least in corporate) gone the way of the MBA? Or has it? In my little corp. world, I see a lot of benefit from the manager having been an IDer and having a MS degree in ID. As such, I've seen the manager able to champion ideas and standards much more effectively than if there was a lack of degree or experience. Our area really shines thanks to this background. The MBA is fine, but you have to have experience and education (formal, certification or informal) in learning theory and learning design. You can't really lead what you don't truly understand. In the most basic view, when you're in a training group, your job is to help resolve problems related to lack of skill or knowledge insofar as they detract from the organization's ability to achieve its results. Not to publish catalogs, not to count exposure-hours, not to crank out completion certificates. It's generally helpful if the immediate manager understands the work that her team performs. I don't think that requires a degree in instructional design. Someone with process-improvement or performance-improvement experience (e.g., Six Sigma) could in theory do well, and perhaps nudge a too-comfortable, old-school training department out of its comfort zone. While I was going through the MBA program, there was one thing that was abundantly clear to me: Know your industry. If you don't, then you will fail. Before signing up for the ID program I had both been apprenticed into ID by degreed-IDers and I had gone to my college library (where I work) and checked out books on learning theory and ID in order to understand the educational/learning management field. This type of learning is not rewarded, and is somehow viewed as not valid. If you haven't done it in class, if you don't have a piece of paper stating so, then it doesn't exist. I happen to disagree with that mentality. Are there MBA grads who are pretty bad? Sure! On the flip side a degree in ID doesn't guarantee that you know what you are doing. Interestingly enough, I see the same degree-based-bias in the Library field. If you don't have an MLIS (masters in library and info science), you aren't considered a librarian - although on rare occasions people hire non-MLIS people to librarian jobs. I've applied to jobs (in academia) where an ID degree was required, but the job responsibilities did not correspond to what ones learn in an ID degree program. Now have I learned a lot in my ID degree program? You betcha! Are most of my new skills going to be applicable to the jobs that I wish to apply for? Probably not. While I wouldn't recommend an MBA, I would highly recommend that ID students get internships in business or some other real-world business experience as early in their studies as possible. I've seen recent graduates from a respected ID program whose preparation was heavily academic. They didn't understand business lingo, they had trouble writing concisely, and they seemed to see ID as a way to design information, not to change behavior. So while I think ID or performance-improvement study & experience are valuable, I'm not convinced that academic training transfers well to the real world. Here in the UK, and I'm sure that if I say this someone will put me right, there are few, if any ID degrees (though there are various multimedia and even 'e-learning' courses). In the L&D field there are a couple of accrediting bodies, but these are vocational rather than academic and these are the typical 'ways in' to the field (TAP and CIPD most well known). Subsequently, very few people that I have met are degree qualified in instructional design, but that doesn't seem to affect the UK industry. So in this respect, in the UK at least, no, ID degrees don't get wasted. However, I would say that it is vital that managers have a background in L&D if they are to, as jadekaz says, champion the ideas of their staff. Otherwise you are prey to the same old misconceptions about learning that Will Thalheimer covered in his last webinar. I agree with Cathy. I was a classroom teacher for years creating instruction (yes teacher = ID to me) for the most challenging audiences - Middle School history students and Alternative Education. Having designed instruction in K-12, and then for K-12 elearning and private and public sector organizations I think the greatest asset has been the experience as opposed to the education ... working in the various areas has allowed me to sprinkle the best approaches into each future area... helping me respect and build to differing learning styles. While I don't think you need a degree in ID to manage ID folks, you certainly need experience in ID. One of the problems with this country is that too many people have MBA degrees with no experience in the field in which they are managing. I have to respectfully disagree that "reading some books" is a prequisite for ID experience. The experience serving under an ID person is far more valuable than the reading about ID and from my experience in ID, there is no substitute for actually doing ID and managers that haven't done ID tend not to be good ID managers...in my experience. While experience in the ID field is preferable if you are going to manage it, you can't discount people's ability to adapt to their environment. A way to know about your environment comes not only from hands on practice, but also from reading and analyzing. This adaptation is what separates a good (insert profession) from a bad (insert profession). Yes I know many people from my years in education that are not that good in (insert profession) because they fail to understand the business or the client.